DSSSB Recruitment 2018: The Delhi Subordinate Services Selection Board (DSSSB) has issued recruitment for aspirants willing to apply for the position of Pharmacist, Nursing Officer, Technical Assistant, Stenographer, Lab Technician, Radiographer, Social Worker under Health and Family Welfare, the government of NCT of Delhi and services department. The candidates wiling to apply for the DSSSB Recruitment 2018 can visit at the official website dsssbonline.nic.in. The last date for the candidates willing to submit the application is August 13, 2018. 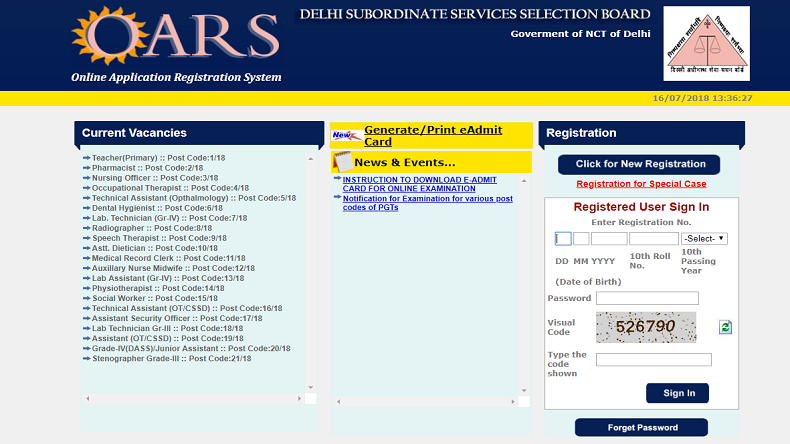 DSSSB Recruitment 2018: The recruitment notification for candidates willing to apply for Pharmacist, Nursing Officer, Technical Assistant, Stenographer, Lab Technician, Radiographer, Social Worker under Health and Family Welfare, the government of NCT of Delhi and services department was issued by the Delhi Subordinate Services Selection Board (DSSSB). The application for aspirants interested in applying for the same can fill the application at the official website of DSSSB i.e. dsssbonline.nic.in. The recruitment examination is scheduled to be conducted in July by the Delhi Subordinate Services Selection Board (DSSSB). DSSSB has also uploaded a calendar with details for the aspirants willing to apply. Nursing Officer: The selected aspirant will get a monthly salary of Rs 4,600. Occupational therapist: The selected aspirant will get a monthly salary of Rs 4,200. Physiotherapist: The selected aspirant will get a monthly salary of Rs 4,200. Social Worker: The selected aspirant will get a monthly salary of Rs 4,200. Speech Therapist: The selected aspirant will get a monthly salary of Rs 4,200. Assistant Dietician: The selected aspirant will get a monthly salary of Rs 4,200. Technical Assistant (OT/CSSD): The selected aspirant will get a monthly salary of Rs 2,800. Assistant Security Officer: The selected aspirant will get a monthly salary of Rs 2,800. Lab Technician Gr. III: The selected aspirant will get a monthly salary of Rs 2,800. Lab Technician (Gr. IV): The selected aspirant will get a monthly salary of Rs 2,800. Pharmacist: The selected aspirant will get a monthly salary of Rs 2,800. Technical Assistant (Ophthalmology): The selected aspirant will get a monthly salary of Rs 2,800. Dental Hygienist: The selected aspirant will get a monthly salary of Rs 2,400. Radiographer: The selected aspirant will get a monthly salary of Rs 2,400. Auxiliary Nurse Midwife: The selected aspirant will get a monthly salary of Rs 2,400. Lab Assistant (Group IV): The selected aspirant will get a monthly salary of Rs 2,400. Stenographer Grade III: The selected aspirant will get a monthly salary of Rs 2,400. Medical Record Clerk: The selected aspirant will get a monthly salary of Rs 1,900. Assistant (OT/CSSD): The selected aspirant will get a monthly salary of Rs 1,900. Grade IV (DASSV Jr. ASSTT. ): The selected aspirant will get a monthly salary of Rs 1,900.